It’s funny that she again mentioned that silly R/C jeep toy of mine. I think I sold it for $5 at a flea market or yard sale because we needed money to pay the water bill that month or something along those lines. Yes, it had been one of my favorite toys, but I hadn’t played with it in years and was nowhere near as upset about selling it as she had been. It’s also funny that she wrote this entire email without once using the <shift> key! if you are still laboring under any guilt re: car insurance, please do me a big favor and give it up. what little i have been able to do for you during your undergraduate career cannot make up for the sacrifices you willingly made for jen and me during high school. 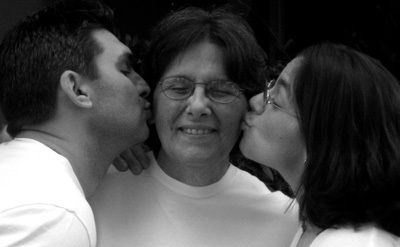 don’t think i don’t appreciate more than you can know your unselfish contributions to the family coffers. don’t think i don’t remember with a deep pang of guilt the fact that you couldn’t go out for the baseball team because you had to work and we didn’t have the money for uniforms. don’t think i don’t realize that you gave up any participation in team sports because i couldn’t support you better. and don’t think i don’t remember thinking how tireless you were only because i couldn’t bear to think about how much better your grades and attitude might have been if you could ever have gotten a decent night’s sleep and not had to work thirty hours a week. i felt so selfish all those years. i wanted to give you so much and yet, so many times, i couldn’t wait for you to get your paycheck so i could pay a bill. if you think that what i give you now in any way makes up for what you gave to me and your sister, don’t. it’s not that i don’t think kids should work – and it’s not that i don’t think you’re probably a better person for it, it’s just that i think you would have been one hell of a person anyway, and maybe you could have been a little happier. i don’t regret letting you work. it was the right thing for the family – and probably for you – but, as a mother, it hurts to think you had to. so, let it go. there is nothing owed, no guilt to be felt. we love each other and we do for each other where there is a need, if we can, and usually even when there is a sacrifice. that’s what makes you and jen and me rich!